Basically, The Station is an adventure game built around exploration. Explore, deduce, learn, solve, and discover the truth. Narration is purposefully limited so the story is told through location and environment, instead of through dialogues or cutscenes. Each area provides details about the plot, which starts to come together as you explore. You will find clues or elements that bring the story together. At times it’s in written form (computer terminals, notebooks, etc.) or through audio snippets. Some details are conspicuous, while others require careful investigation of your surroundings. There are also various puzzles and objectives that must be solved to progress through the story. Work from one section of the map to the next in order to accomplish your goal. The who: Axiom Corporation – a company that these fine scientists and engineers are working for. The crew is led by Captain Mila Lexa, daughter of a famed space explorer. Researcher Silas Haze is your go-to for all mission-related research. If you need scientific expertise on space or alien life, this man has the knowledge. Engineer Aiden Vyse is the guy to go to regarding all devices, hardware, and machinery aboard the Espial Space Station. The Espial Space Station: This is what you explore while you're piecing together the details and events taking place during missions. The station is expansive and rather fancy, with automation, creature comforts, and amazing window views galore. You will need to consult your map from time to time to get around, as you will find yourself scouring every inch of this place while trying to piece together the events that transpired inside. The where: Planet Psy Prime. According to my research, this planet closely resembles Earth’s chemistry and environment, just enough that it may be a great option for colonization or relocation. This is big news for our crew, who is ready to take on the challenge to try and make contact with any life form on this floating orb. At this point, the question becomes whether the inhabitants of Psy Prime are peaceful or vengeful. Did they welcome our crew with curiosity and open arms, or did they attack them as foes? Only you have the power to unlock the truth. 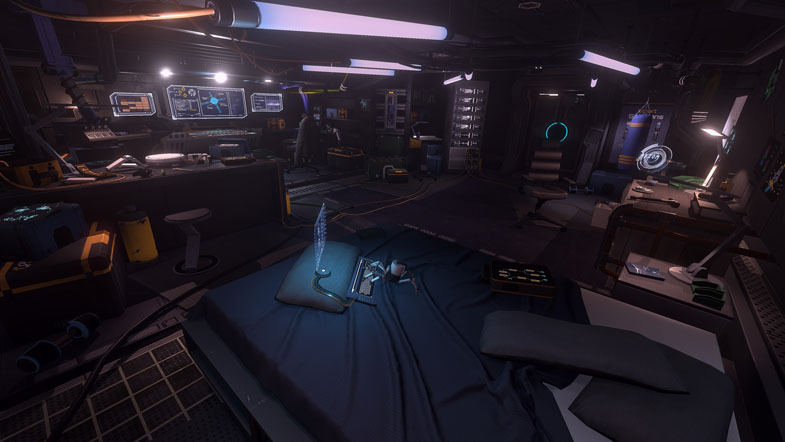 The Station emphasizes augmented reality, which affects the experience you’d expect out of an adventure game. The introduction starts with a narrative cutscene that feels a bit too philosophical, which may cause younger and more action-driven gamers to lose interest. Once in-game and at the Espial, the augmented reality and first-person experience begins. Gameplay controls are basic and intuitive. You’re coached on mouse control and keys to examine objects or manage your inventory. From here on out you are the explorer. Occasionally objectives are revealed as you traverse the Espial and interact with objects in real time. Pick up items, open drawers, snoop, explore, and investigate to find whatever may be left around to be discovered. The environment, although not 100% realistic, is highly interactive. The map is clean and appealing to the eye. The sounds come mostly from the environment of the Espial, mixed with the occasional audio snippets you get from the crew as you explore. The puzzle and mystery themes work well together. That’s partly because the given objectives are obvious, but the rest is unclear, so a large amount of your time will be spent piecing together what actually went down in this space station. Where is the crew and what is their status? 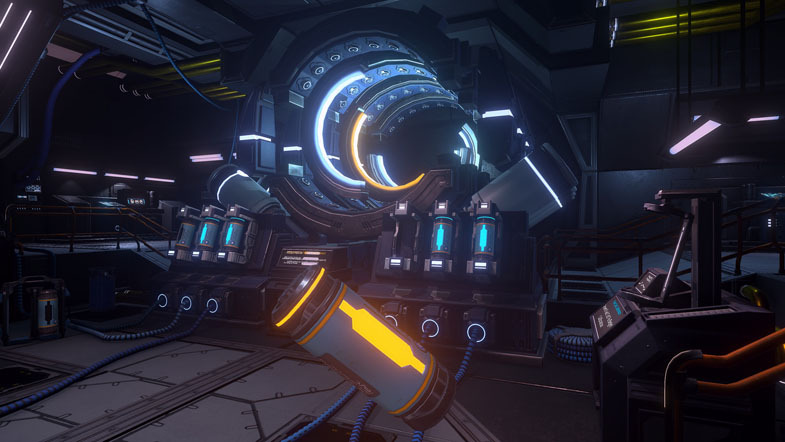 Combined with the fact that you’ll also be on the lookout for what may or may not be lurking around every dark corner, The Station earns the "atmospheric" label it claims to deliver on Steam. Pros are incredible graphics and creative plot. A con is that it caters to a specific niche of gamers. You’re left in the dark as you progress through the game, with just enough given to keep you determined to seek out more clues and explanations. Those looking for alien carnage may want to orbit on past, but fans of sci-fi space exploration will find The Station to be an experience that's out of this world. Puzzles and mysteries in an atmospheric setting, along with an intriguing storyline that delivers, makes it the kind of adventure that doesn't give away goodies from the start. For the patient explorer, this is a real treat.